Frank L. Elliott, 59, passed away unexpectedly on July 2, 2018. 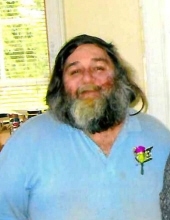 He is survived by his beloved wife of 20 years, Brenda Elliott, his step-son Patrick Dalley and his wife Valerie Dalley all of Georgia, his step-grandson Patrick L. Dalley of Wolcott, and many friends that are like family to Frank. Frank grew up working on farms, and at Bellows Free Academy in St. Albans. He was a “jack of all trades, and a master of none”. He liked to go fishing, hunting, long rides with his wife and to listen to country music. He really enjoyed Elvis and NASCAR. His favorite driver was Jeff Gordon. He was known as a joker and loved to make others laugh. We’ve no less days to sing God’s praise, than when we’d first begun! I want no rites in a gloom filled room. Why cry for a soul set free? Remember the love we once shared. Miss me, but let me go. It’s all a part of the Maker’s plan, a step on the road to home. And bury your sorrows in doing good deeds. Miss me, but let me go. Brenda would like to thank everyone who came the night that Frank passed away. Thank you to AmCare Ambulance, Georgia Fire and Rescue, Taylor and Meg Smith and other friend. We are grateful to all of the other people who have helped us throughout the years. Memorials may be made to the American Lung and Heart Associations. Frank, you are gone, but will never be forgotton, and will be greatly missed by all, until we meet again our friend! Arrangements are entrusted to the Brady & Levesque Funeral Home, where memories and messages of condolence may be shared at www.bradyandlevesque.com. To plant a tree in memory of Frank Leroy Elliott, please visit our Tribute Store. "Email Address" would like to share the life celebration of Frank Leroy Elliott. Click on the "link" to go to share a favorite memory or leave a condolence message for the family.